Economic news sometimes manages to tickle the heel of our crazily careening Trumped-up news cycle. Recently, the issue of “value capture” has been able to tickle the heel of the economic news. That’s right, people; it’s that big a deal. This is a bit frustrating to those of us who think this is a vital issue. After all, it has to do with some of society’s most important themes: how the community manages to fund infrastructure and public goods – and generally the relationship between individuals and society itself. But, I can’t expect you to agree with me about how important this is until we unpack it a bit. So let’s try and do that. The basic idea of “value capture” is pretty well understood. People who are willing to actually consider it find it hard to disagree with. (If you’d like a quick introduction, here’s an informative three-minute video.) The notion is that public investment, such as in, say, a new commuter rail station, disproportionately benefits the owners of nearby real estate. We all know this: “Close to transportation” is a standard selling point in ads for New York City rentals. Nearby public transportation is a convenient amenity for which people are willing to pay. The value that’s there to be “captured” attaches to the land – the locations whose proximity to the amenity makes them worth more in the market. 26 East 23rd St. — one block from either 23rd St., Broadway or 23rd St., Park Ave.
New York Governor Andrew Cuomo, having noticed that the New York City subway is struggling for funding and falling into disrepair, and that the newly completed Second Avenue subway extension has created big piles of real estate value on the Upper East Side of Manhattan, has proposed a value capture scheme to help fund the subway. A study by NYU economists Giancarlo Falcocchio and Constantine Kontokosta found that in Manhattan’s main business corridors, south of 60th St., being close to the subway adds $3.85 per square foot to the value of commercial real estate. We would not want you to think, however, that value capture is a new idea. Indeed, though it may just be dawning on municipal governments, corporations and other big-time real estate operators have been familiar with this idea for a long time. Examples abound; to give you an idea of just how pervasively entrenched this practice is in our modern economy, here is the most easily-findable example I could think of. 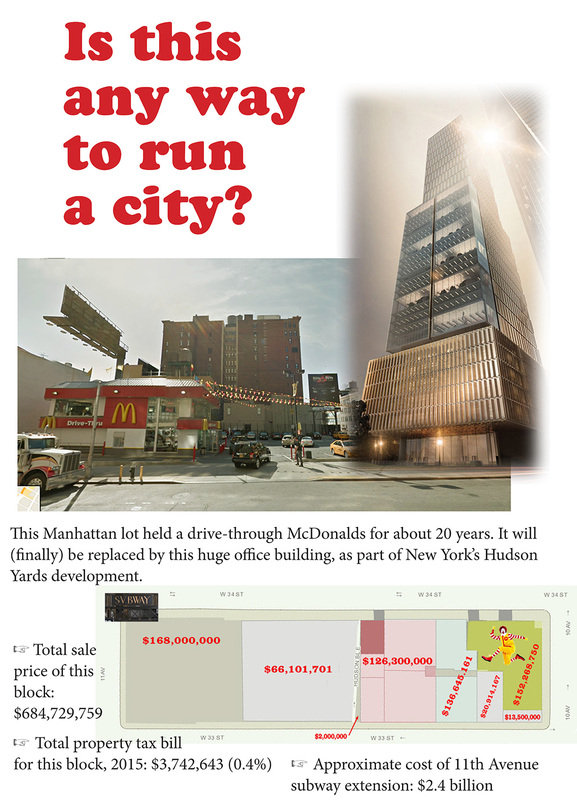 It’s been widely reported that real estate is the McDonald’s Corporation’s main source of profit; flipping burgers is just how its employees busy themselves while the company waits for prime locations to “ripen.” No doubt you can think of examples of this practice in your local community. But, time is money, so I did it easy way: asked the McDonald’s website to list locations in midtown Manhattan, and checked them out on Google Maps. Keep in mind that there are many other companies, and individuals, who engage in this sort of economic opportunism. Moreover, these are just the first few examples from the find-a-restaurant page on their website – and they don’t even include my very favorite example of this sort of thing! It’s also worth keeping in mind that it’s not just train stations that create capture-able value. The fact is that any public amenity or improvement (assuming it was worth building in the first place) adds to the real estate value that is “captured” by private owners of real estate. And in the final analysis, it may be that “capture” isn’t quite the right verb for for us to use in this case. It makes the value sound like some wary little animal that’s going to scamper off if we don’t act quickly. But that’s not really the case. After all, the value of public improvements attaches to land, and we know where the land is – especially in this day and age, when one can find so many excellent examples of private, corporate “value capture” in 15 minutes, using free online tools.